A pair of major announcements feature prominently in our concluding coverage of Cultivate14, formerly the Ohio Short Course. 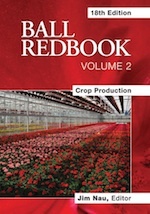 Our interview with Gary Vollmer of Ball Floraplant at Grower Day 2014. One of a series of video interviews. Ontario research is expected to improve control of Q biotype of whitefly. Working with a young super achiever? Add New Brunswick to the list of provinces that have adopted Canada's national organic regime.